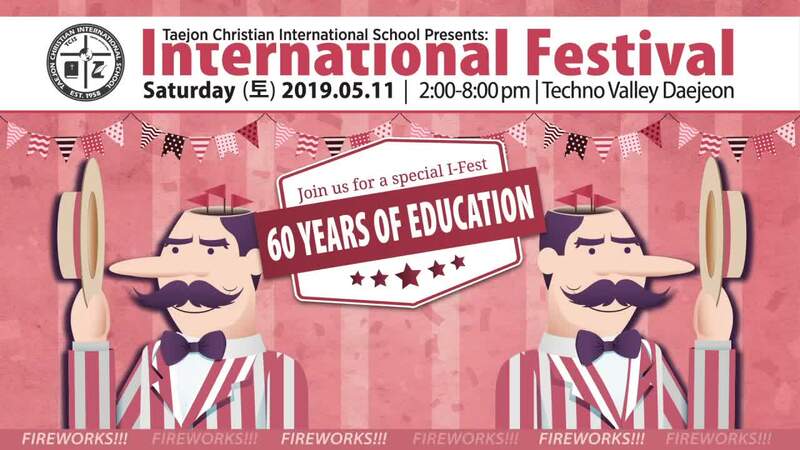 TCIS Invites You to Our Annual International Festival! Held on our beautiful green campus in Technovalley, I-Fest is a Spring carnival with an international flair! This event will be held on Saturday, May 11 from 2:00-8:00 pm. There is something for everyone! Fireworks will start after sundown! There will be a large Flea Market held through the day, with LOTS of second-hand treasures to be sold! This year is a special one for TCIS. This school year marks our 60th Year Anniversary for international education in the city of Daejeon! We will try to make this I-Fest a bit extra special, and we would love to have you celebrate with us! Much of I-Fest is run by students, parents, and student groups from our school. Proceeds from I-Fest go to charities and student club projects. It is always a great day outside and a fun way to support charities and education. We hope to see you there! 초록이 예쁜 TCIS 테크노밸리 캠퍼스에서 봄의 축제 I-Fest가 열립니다. 모든 지역주민들과 함께하는 행사이며 5월 11일 (토) 오후 2시부터 저녁 8시까지 진행됩니다. I-Fest 는 지역 공동체를 위해 학생과 학부모 그리고 학생 클럽이 함께 준비한 지역 행사로 수입금은 학생들의 클럽 프로젝트와 지역 복지단체에 전달 됩니다. 아름다운 5월에 가족가 친구들과 함께 즐거운 야외활동도 즐기고 지역사회와 교육을 지원하는 즐거움 또함 함께하실 수 있습니다. 행사장에 대한 추가 정보와 위치는 학교 웹사이트에서 확인할 수 있습니다. 문의 사항이 있으면 언제든지 웹사이트를 방문해 주세요. TCIS would like to invite anyone and everyone to join us for our annual Christmas Bazaar, to be held at our campus on Saturday, December 8. From 2:00 - 6:00pm, TCIS will host an event for the whole family. There will be food, live music, an English book sale, flea market, games & crafts for the kids... and even a visit from Santa Claus! We always have fun at this event and would love to have you come and join us as well. This event is open to the public, we hope to see you there! *All proceeds to go to charities and student groups. Join us as we present this four-day camp on robotics. Science camp will focus on STEM skills within the area of advanced robotics. Guest professor, Mr. Lawrence Kok, TCIS faculty, and KAIST students, campers will have a fun time learning about robotics and making meaningful connections. This camp is for any students in grades 8-11. Why attend the Winter Science Camp? Sponsored in partnership by TCIS, the Linden Group, and the CIS Group we invite all interested families to the TCIS campus and visit with college representatives from around the world. Representatives will have information available and will meet with attendees to answer questions. There are currently a number of colleges and universities set to attend and more possibly to join. This is a public event, open not only to the TCIS community, but to any interested families. *These lists will be periodically updated to keep you informed of school attendance.